The Salamander S flange is designed to prevent aerated supply water being drawn in a pump from the cylinder or tank. When a pump is fitted to boost the supplies from the cold water storage tank and from the cylinder the risk of aeration is increased many times. If aerated water is drawn into a booster pump or showers it can cause a number of problems. These include sudden temperature fluctuation at the shower, premature pump breakdown and a noisy pump. The Salamander S flange encourages aeration to follow a path to the vent preventing aerated supply water from being drawn in to the pump and therefore reducing the risk of the above pump issues from occurring. 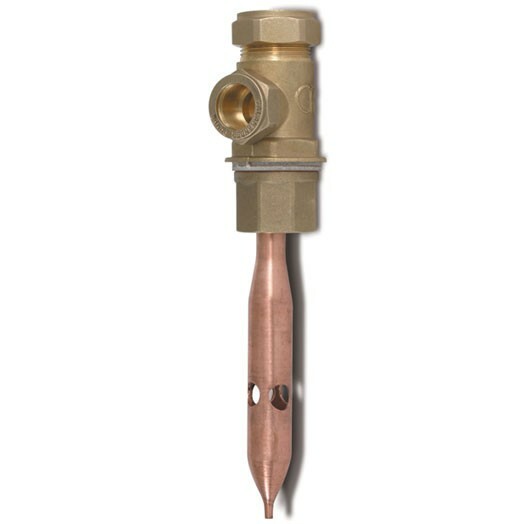 There is a 22mm compression outlet to the pump and a 1” BSP female adaptor to suit connections on either male or female top entry cylinders.